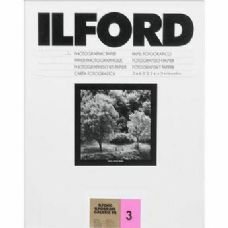 ILFORD Ilfobrom Galerie is one of the most famous and longest running papers from Ilford. Prints made on this paper have deep, rich, blacks and brilliant whites with an excellent tonal rendition. It is suitable for a wide range of applications that require a fine quality printing paper such as archival prints for museums; collections and exhibitions; prestige applications which focus attention on both the look and the feel of the print. A traditional graded paper, now only available in grade 3 (grade 2 has recently been discontinued), you need to ensure that you control contrast as much as possible in the negative. Ilford Galerie was a favourite with legendary American landscape photograher and master printer, Ansel Adams.